Konggang New City Keyiju Business Inn offers rooms with free WiFi in Xianyang, attractively set 28 km from Small Wild Goose Pagoda and 7 km from Chateau Changyu Rena. 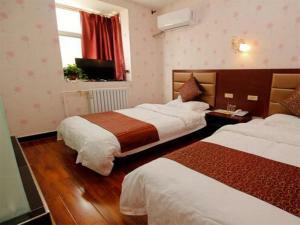 9 km from North Xianyang Bus Station, the property is also 11 km away from Xianyang City Musuem. The accommodation provides a 24-hour front desk. All guest rooms in the inn are equipped with a flat-screen TV with cable channels. Xi'an Xianyang International Airport is 2 km away. IMPORTANT: Due to local regulations, Konggang New City Keyiju Business Inn is only able to accept guests who are Chinese nationals. Guests must present a valid PRC Identification Card at check-in. If you are not a Chinese national, please choose another property.